Madame de Pompadour… does it hit anything in your mind? No… well she was the woman (yes a woman) who gave Pompadour hairstyle immense fame. It was only later that men like John Travolta, James Dean and Elvis Presley started sporting this hairstyle and it soon became associated with men’s rock and roll hairstyle. Men continued to wear this hairstyle till today and it has seen various variations in the past years. It is not seen as a mere hippy style anymore. ANYONE can wear this hairstyle ANYWHERE. It blends well with both formal and informal settings. This vintage style never goes out of fashion and blends well with the long face shape. Having a strong association with Elvis Presley, it is highly mistaken for a hippy style. It actually gives off a very gentle man look. Classic look features a tapered style, but you should be careful not to let let your side be too short as it won’t balance out with the long hair that way. If you happen to be a professional or business man, Slick back pompadour will definitely blend well with your profession. Like the name suggests the sides and back are cropped very close to the skin, whereas the hair on top are longer in length. This helps to set a distinguishing line between the top and the sides. You can side part it either to the left or right. Note that the hair on top is not simply slicked back, but it is combed back a little to the side. This look will make your round face slim. Although it looks amazing, but it is a high maintenance look since you have to crop the sides and back regularly. 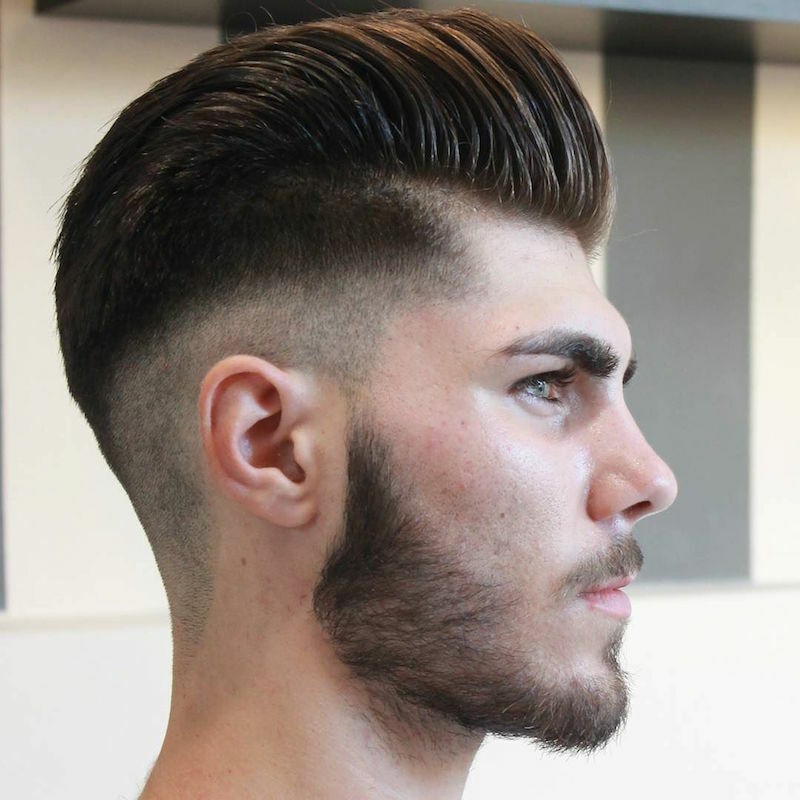 Another example of a modern pompadour is this flawless hairstyle that is a combo of undercut and pompadour. The hair on the sides are clipped close to the skin while hair on top are long presenting a disconnect between hair on the sides and top. The volume of longer hair is enhanced using blow dryer and set in place with the help of a gel or pomade. This is a classy modern appearance of pompadour worth the try! If you are someone who wants to look awesome everyday and have the time to put that much effort, then this is certainly for you. This variation as the name suggests features high fades with the hair on top that are much longer from the front and gradually shortens towards the crown. High fade pompadour gives a very edgy look and makes your round face look slim because of the additional height given to the hair on top that also shrinks the width of your face. The recent David Beckham hairstyles show that how he has been experimenting with different versions of pompadours. It is a must try for all. Young boys love to garner all the attention coupled with their self-confidence to always try new hairstyles makes this a perfect hairstyle for guys. If you are looking for a medium length hairstyle, this one is good to go. The long hair on top is swept to the sides in a messy and ruffled manner while hair on the sides are kept short. They balance with the length of hair on top. This one is definitely a head turner and a must try this year. Author: John is a passionate blogger from menshairstylesweb.com who loves to write about men’s fashion. During free time he enjoys sharing his ideas and latest fashion trends at different blogs. Check out their FACEBOOK page, click and go!